When it comes to golf, Scotland is the place to go and with over 500 courses there's one (make that several) Scottish golf courses for just about everyone. Of course, quality is more important than quantity but Scottish golf has it all. Golf courses in Scotland are among the best in the world, and are coveted by those who truly love the sport. A Scotland golf vacation is the experience of a lifetime for golfers from all corners of the world, and a trip to St. Andrews Golf Course might be considered Number One on a 'bucket list' of golf vacations in Scotland. Scotland is known as being home to the sport of golf - and with good reason! The first historical mention of the sport was not a positive one, and is found in a declaration made by King Jamess II in 1457 when he banned football (soccer), golf and other sports. His reasoning was that these activities diverted men's attention from the sport of archery - which was obviously more useful on a day-to-day basis in a country constantly trying to defend itself from invaders! Luckily for the those who enjoy golfing today, King James eventually relented and even had a go himself. Over a decade later, it's said that Mary Queen of Scots played a round of golf only hours after her husband, Lord Darnley, was murdered. Some historians believe that an early form of Scottish golf existed during the 13th century, and was invented by shepherds who were amusing themselves during the long days spent on Scottish moors. This version used sticks and pebbles and targets. Others think that it may have been modeled after games that were brought to Scotland by invaders from different countries. 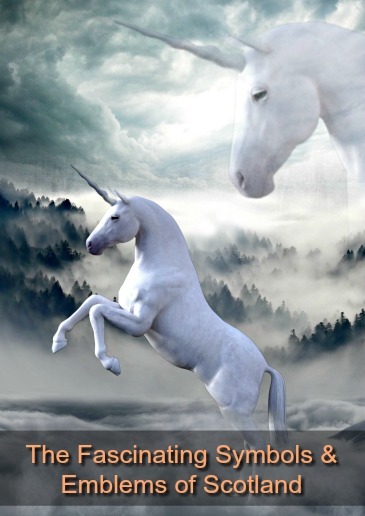 There's also more than one theory for the origination of the actual word 'golf'. One of these is that it's derived from the Scottish word 'gowff' meaning to hit. Another is that it is a variation on the name of a Dutch ballgame known 'Kolf' (this game may have resembled ice hockey). In the 17th century golf took a step forward, and moved from a casual sport to a more competitive one. The first trophy cup winner was John Rattray (a friend and colleague of Bonnie Prince Charlie). However, it wasn't until towards the end of the 19th century that golf became a sport of the 'masses'. Prior to this it had been a very expensive sport mainly due to the cost of the hand-made golf balls (feather inside hand-stitched leather casing). In 1848 the easier to produce and less expensive 'Gutta Percha' golf ball (aka the 'Guttie') was invented by Reverend Paterson of St. Andrews (very similar to the golf ball we know today) and many more people could afford to play and competitions began in earnest. ), 'Young Tom' Morris (Old Tom's son! ), James Braid (a pioneer when it comes to the use of aluminum-headed putters), George Duncan, Bernard Gallacher, Sam Torrance, Colin Montgomerie, Sandy Lyle, and Paul Lawrie to name a few. The first set of written rules for the sport were documented in Scotland in 1744. The Old Links at Musselburgh Racecourse is believed to be the first one every built, and therefore also the oldest golf course in the world. 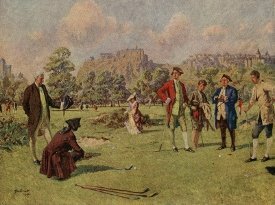 The first documented international golf match was held at the Leith golf course. The Leith golf club was also the first one to have a club house for members. In 1868 'Young Tom' Morris was the proud owner of golf's first recorded 'hole-in-one'. The first women’s golf club was formed at St. Andrews in 1895. Scotland has some of the very best golf courses in the world, and there's something to fit every budget, taste and itinerary. Alongside the spectacular, historic and world-famous Scottish golf courses such as St. Andrews and Muirfield, this tiny country has literally hundreds of smaller, less well-known courses which are truly 'hidden gems'. Not only are the links themselves a thing of beauty, the surroundings are often spectacular. You can choose from spectacular coastal views, grand castle backdrops, rolling countryside that stretches for miles..... and much more. Whether you're an 'expert' golfer, or just a beginner, golfing in Scotland will more than live up to your expectations. Built in 1850, this is one of Scotland's oldest golf courses, with the sport having been played here since the 16th century. Designed by Old Tom Morris and James Braid, this is a demanding course which can test even the best golfer, there are no 'easy' holes on this one! The weather can significantly (and fairly regularly) increase the difficulty of playing these links due to an unpredictable combination of wind and rain. About an hour from St. Andrews. Driving Range. Built in 1882. Home to some of Scotland's finest links, best-kept greens and spectacular views. This well-maintained course is uniquely challenging, and the most demanding of Gullane's three courses. 18 holes. Par 71. Driving Range and Putting Green. Built in 1891. Designed by H. S. Colt, this is the only golf course to have hosted the Open Championship, the Amateur Championship, the Mid Amateur Championship, the Walker Cup, the Curtis Cup and the Ryder Cup Matches. Muirfield is definitely one of Scotland's finest golf courses and home to the 'Honourable Company of Edinburgh Golfers' (the oldest club on record, dating back to 1744). Most definitely both challenging and demanding, but without being 'tricky'. 18 holes. Par 70. Putting Green. Built 1832. A traditional and challenging golf course with breathtaking views, this is one of the oldest courses in the world. A demanding course with tight fairways and some interesting and 'quirky' holes... but one with a lot of charm which makes it a memorable (and fun) experience. 18 holes. Par 71. Driving Range and Putting Green. Built in 1851. This legendary Scottish golf course, designed by Old Tom Morris, was the birthplace of the British Open in 1860. A demanding and rugged course, it offers a truly 'one-of-a-kind' experience. About 30 minutes from Glasgow. 18 holes. Par 71. Driving Range and Putting Green. Built in 1878. Another of Scotland's coastal golf courses, the demands of Royal Troon's design is often magnified by a stiff wind. Inevitably resulting in another challenging round! 18 holes. Par 71. Driving Range and Putting Green. 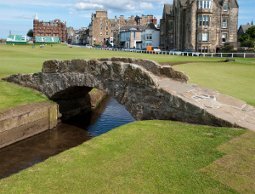 Built in 1850 and designed by Old Tom Morris and Alister MacKenzie, with contributions from Daw Anderson and possibly others. This is Scotland's most famous golf course.... and the oldest in the world! The legendary links regularly host the British Open, and every dedicated golfer wants a chance to play here. The Old Course at St. Andrews is quite unique and features enormous greens and a multitude of bunkers (some of them are enormous too!). The beautiful and historic clubhouse and much-photographed Swilken Burn Bridge add the finishing touches to an unforgettable golfing experience. If you want to learn more about this iconic Scottish golf course , here are a couple of books that you may want to check out... The Spirit of St. Andrews and Golf at St. Andrews 18 holes. Par 72. Driving Range and Putting Green. Originally built in the early 1900's, this Scottish golf course was destroyed and the land used as an Air Force base during WW II. Luckily for the golfing world, MacKenzie Ross designed and created a wonderful new course in 1946, one which consistently ranks among the finest in the world. Located on the west coast of Scotland, Turnberry Ailsa course is surrounded by spectacular scenery, including the Isle of Arran, ancient castle ruins, the famous lighthouse, the volcanic outcrop called 'Ailsa Craig' ... you can even see the coast of Ireland if you're lucky and the weather is clear. About one hour from Glasgow. 18 holes. Par 70. Driving Range and Putting Green. Built in 1897, this is one of the best classic links courses in Scotland and offers a very traditional Scottish golf experience. Yet another coastal location, with some of the links literally perched on the edge of the ocean. Unpredictable weather conditions (regularly windy, and often rainy), combined with a creatively designed course make this another challenge to golfers who aren't faint of heart. 18 holes. Par 71. Driving Range and Putting Green. Now that you've learned about the history of golf in Scotland and know a little about the best Scottish golf courses, you're ready to 'golf Scotland' for real. So, off you go and have fun!